Ekiti State chapter of Afenifere Renewal Group (ARG) and Progressive Youth League (PYL) have descended heavily on the governor, Mr. Ayodele Fayose, for appearing at an Abuja Federal High Court in solidarity with the leader of the Indigenous People of Biafra (IPOB), Nnamdi Kanu, who is standing trial for felony. 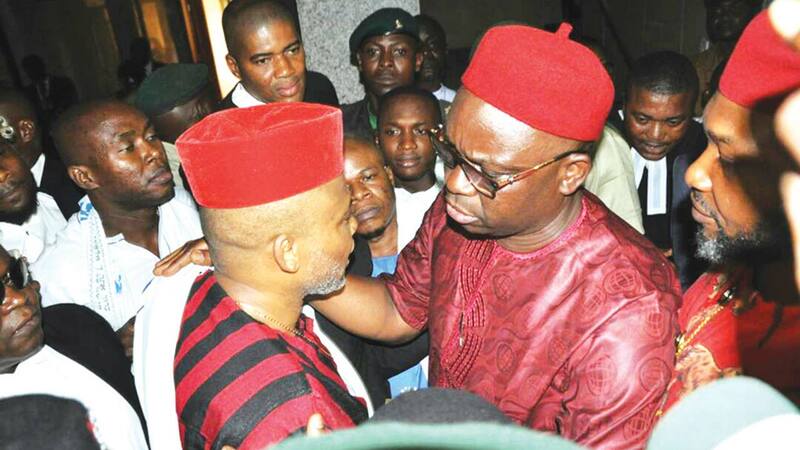 The two groups bared their minds in separate statements in Ado Ekiti on Wednesday. the constitution, however, condemned alleged abuse of those rights by the governor. Awotiku said: “Despite receipts of monthly statutory federal allocation, budget support funds, bailout funds running into billions of Naira, Ekiti workers are under the yoke of non-receipt of their monthly salaries and allowances. “The pensioners are not faring better; this is a governor displaying executive rascality all over Ekiti State and beyond. He has brought governance to a ridiculous level. He can be excused for his own style of leadership and manner of delivery but there are well designed standards for the office which he occupies but which he brings to ridicule. Aribasoye said: “Fayose’s action of going to the court in Abuja to show support for Kanu has nothing to do with the welfare of the people of Ekiti. It appears the man is not ready to provide governance for the people of Ekiti and we are calling on him to resign honorably. irrespective of where one hails from. He promised to also attend the trials of former National Security Adviser, Colonel Sambo Dasuki (Rtd), and the leader of the Islamic Movement of Nigeria, Ibrahim jEl-Zakzaky.